Crystallography is an interdisciplinary science covering a wide area, from biology to earth sciences, mathematics and materials science. Its role is growing, owing to the contribution crystallography can offer to the understanding of such diverse fields as biological structures, high-temperature superconductors, mineral properties, and phase transitions. 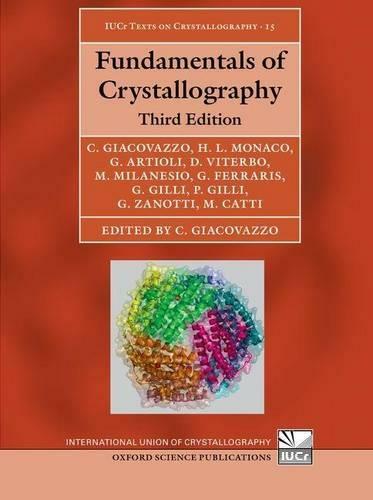 The book describes both the theoretical bases and applications of different areas interacting with crystallography. As with the first and second editions, it is organized as a collection of chapters written by recognized specialists, with all contributions being harmonized into a unified whole. The main text is devoted to the presentation of basics; the appendices deal with specialist aspects. In this third edition topics have been updated so as to document the present state of the art: emphasis is placed upon areas of current research. To facilitate learning and make teaching more effective, new illustrations have been introduced. As with the second edition, a software package is included via the book's OUP web site: modern graphics will help users to better understand the basics of this science via three-dimensional images, simulation of experiments, and exercises.